Naija Daydreamer: An Interview with a Witch!!! Yes people, you read the title correctly. I think this might be my most interesting title yet! I just started a new job at IBM on Monday, it is going ok so far, although all the i.t and information systems training is going over my head. I am terrible with computers! Anyway, the most interesting thing about the place is the people. It has really given me an insight into how oyinbo people think. They can be so brutally honest sometimes, its almost scary. I see why they can get frauded now, its cause they are so damn honest and trusting. Its an admirable quality, but as a Nigerian, we have been taught to treat everything and everyone with caution. The fact that I am a private person to people I just meet, also makes me shocked when I meet people who tell you the story of their life in 5mins. Anyway, there is this girl called Naomi, and during lunch she started talking about how she doesn't believe in God, and then she said she's a WITCH! I wasn't really paying attention, but as soon as I heard that word, I looked up and said, say what?????? 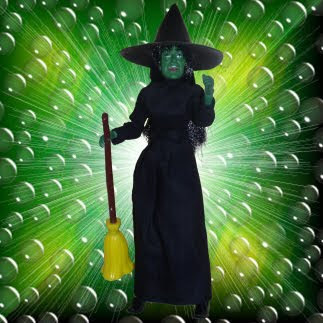 She then repeated that, yes, I am a witch! But its nothing like you see in Harry Potter or Sabrina, its much simpler than that, and we don't all do evil. Me I was not even thinking Harry Potter witch oh, my mind had gone straight to Naija film, blood sucking night flying witches, yes nollywood fucked up my childhood lol! I then proceeded to interview her, as in I asked her loads of questions, and I wrote it down cause I found it so interesting, albeit very disturbing! I thought, my blog followers have to see this oh, because how may of you guys have interviewed witches? I think this might be a blogsville exclusive actually! Your girl is going to make an excellent journalist someday! So here's my interview with a witch! B: How did you get into witchcraft? N: I was questioning the whole concept of religion as a teenager, as most people do, trying to understand the world and the reasons why things are the way they are in the world. I did some research and found Paganism. Its exact definition is varied, but it is technically the oldest religion in the world, and each individual makes up their own rules to suit them. There are various types, but I prefer the Greek mythology, and so I worship the Greek gods. There is no particular book although there are various practices. B:Are your family pegans as well? N: Far from it, my dad is catholic and my mum is Church of England. They do not really practice, but they definitely will not agree with this so they do not know, and I do not plan to tell them. My dad in particular would throw a fit because he is very judgemental, and he is against anything that's alternative to the church. B: Do you know any more witches? N: I have chosen not to join a convent because some people carry negative energy which I do not want to interact with. Although my boyfriend is also a pagan, I worship on my own. B: So can you do wicked things to people? N: Yes I can, but I choose not to because I am a white witch and practice white magic. Because anything you do, you get back to you in threefold, so if you do good, you get good back in threefold. Same goes for those people that choose to do dark magic, they get evil back to them threefold. I can put spells on people but choose not to. B: So what powers do you actually have? N: I am still learning alot of it, as I have only been practising for a couple of years. I can sense negative spirits and evil. I can also see and speak to spirits. I saw the spirit of my grandmother the day she died. When I was in college, I saw a ghost that walked through the walls. Apparently, she committed suicide because she was a cleaner and was in love with the landlord but could not be with him. Her ghost has been living there for a long time. Seeing the ghost was not scary at all, more peaceful. I am also learning to read tarot cards. Unlike what people think, they do not predict the future. All they do is tell you is that if you continue on the path that you are on, this is a possible outcome. B: So what is your view on Science? N: I think science is a way for people to try and explain things they do not understand. I am not against science at all, but I do not believe in the big bang theory and things like that, as its just trying to explain the universe. And finally she doesn't dress up as a witch for Halloween because it mocks the whole religion. Before I could ask her any more questions, our break was over. I am sure the babe is scared of me cause I asked her so many questions, but she seemed really delighted to explain it and felt like she was talking to someone who was understanding her. If only she knew! So what do you guys think? Is she really onto something that we haven't caught onto or is she just stark raving mad???LOL! Lmao...forreal???? OMG....wow..i'm like so speechless, a real witch. I don't believe in it though, but still a fun read. That is some crazy ish..lol I No reason to doubt that witches exist...I once met a guy who dabbled in witchcraft, crazy crazy crazy...Nice read.. I can understand why she'd be happy to answer your questions. Sorta a setting-the-record-straight type thing, at least that's how I see it. Kinda like the way we're happy to correct people when they ask if we still live in trees and walk around naked. Must've been an interesting conversation though. my nigerian mojo will tell me to flee from that witch. my non-nigerian mojo still inclines me to tell you to run!!!!! as in u guys have nooo clue! it was sooo interesting! Miss B, you no go kill person!! You get small liver shaa. I for run as far as my legs can carry me. Witch shaa... I did read that the practise of witchcraft is actually more commonplace than we realised. It makes nollywood look like child's play in comparison. Good side of it though: you must have been radiating positive energy a.k.a good spirit for her to have kept talking to you!! This is as crazy as it will sure get with you!wetin? !You and your tory sef.. Stop meeting all these psycho. I have met several white witches and I understand their ideas. i dont think people with alternative worship practices are stark raving mad as you put it. I am a Christian and the same way the idea of faith in things unseen seems mental to non-christians, is the same way you might view her outlook on spirituality, but it doesnt make her crazy. She is interesting, different and not stuck in the expected and accepted that many nigerians are stuck in. But great interview. can we have a part 2? Paganism I think is different from Wiccan, so maybe your colleague is a bit scattered. There are many religions in this world sha, to each their own. I agree with Myne. She is more Wiccan than pagan. Pagans worship a lot of gods and dont cast spells. She is still not getting it right. Any way - witches don't really scare me. Do you mind if i ask you what you do at IBM. And I dont think Oyibos are brutally honest. They are trusting, yes, but not so honest. They have a gift of saying a whole lotta nonsense without actually telling you anything. I learn to read between the lines when i interact with them. I think this girl might be confused or mabybe I am. Paganism and witchcraft are not the same thing. Pagans believe in many Gods but witchcraft at least in the white world are like wiccans or people like that. Idk sha I'm not really an expert on this. maybe shes confused or somthing, but shes a real sweet girl though, our beliefs dont really define weather or not we are good person is what I have learnt!